Swedish novelist, writer and feminist. "The first volume of my Sketches of Everyday Life was published in 1828, the second in 29 and the third containing the H. Family the following year. 1833 appeared the President's Daughters and two years later Nina. 1836 was published the Neighbours and the following year the Home or Family Joys and Sorrows, in thirty nine: Strife and Peace or Scenes in Norway, and the Bondmaid: a [Romance?]. 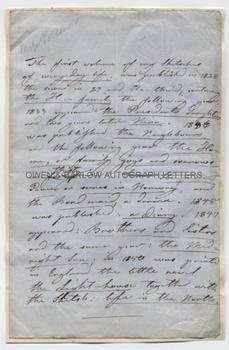 1845 was published: a Diary. 1847 appeared : Brothers and Sisters and the same year: the Midnight Sun. In 1850 was printed in England the little novel the Light-House together with the sketch: Life in the North. Translations:- were made about 1833 first in Denmark and then in Germany of the H. Family and the President's Daughters and in following years as the books issued from the Swedish press. About year 1844 the Sketches were translated in Holland and in England, one year later in the United States of America and about the same time in Switzerland, France and Russia." 8vo. Approx 8.25 x 5.5 inches. Laid down by edges of last leaf onto part of an old album page. In very good condition. An interesting and intriguing item. From the list of books which Fredrika Bremer mentions, the document can be dated to around 1851. It appears that Fredrika Bremer is responding to an inquiry from an English speaking correspondent, possibly in connection with the translation of her books into English. The majority of Bremer's books were eventually translated by the poet, Mary Howitt, whose translations appeared between 1852 and 1875. 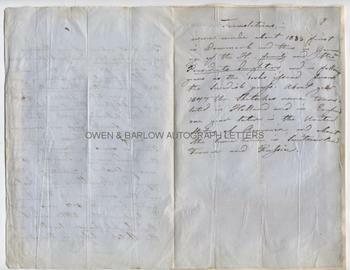 We also entertain the possibility that the recipient of the bibliography was the translator and journalist, Anna Blackwell (the sister of the first woman doctor, Elizabeth Blackwell), as the album from which this document was taken contained a number of other letters addressed to Miss Blackwell. Fredrika Bremer is one of the most important writers of 19th century Sweden. Her books were also popular in translation and much admired in Europe and America (in Louisa May Alcott's 'Little Women', Mrs March reads to her four daughters from Fredrika Bremer). However, it is perhaps as an early feminist that Fredrika Bremer made her greatest contribution. Her novel 'Hertha' (1856) deals with the repression of women and led to a debate in the Swedish parliament which eventually brought about changes in the law and was the start of the feminist movement in Sweden and in much of Europe. Following a campaign led by Bremer, women were given the right to vote in Sweden in 1862. The first university for women was opened in Sweden at her suggestion. She was also instrumental in other reforms of schools and social conditions and was a vocal supporter of the anti-slavery movement. Autograph material of Fredrika Bremer is scarce. PRIVACY | Your Privacy Rights All rights reserved. 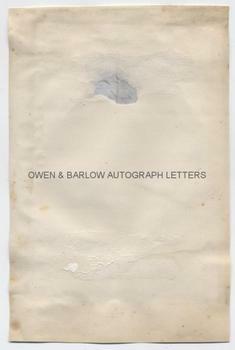 Copyright Owen & Barlow 2019.